I’d like to thank co-blogger Wendy Garfinkle over at Pen and Keys (http://wendycgarfinkle.wordpress.com/) for writing this article with me. 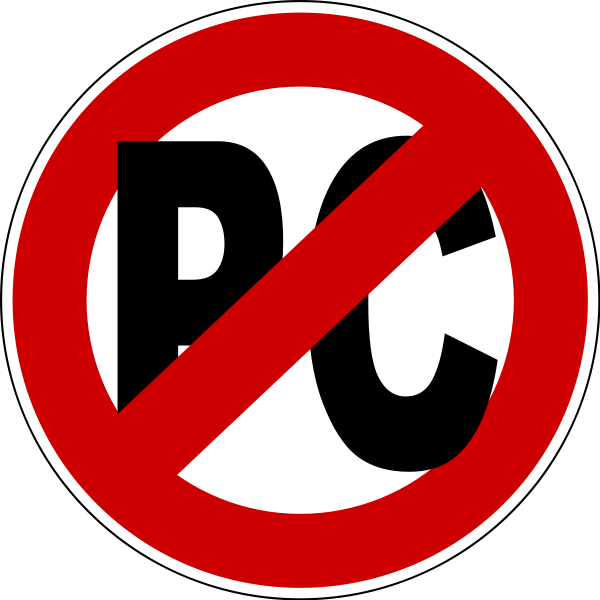 I’m plumb annoyed at the stupidity of political correctness, “PC,” as it’s commonly referred to. But I must continue this discussion. I find “political correctness” to be more offensive than anything else and it’s making us dumb, not able to live with each other, and more alarmingly, people are afraid to be themselves. Yes I said it and I’ll say it again – people are afraid to be themselves. What happened to speaking your mind whether you offend or not? Didn’t we always have to deal with being offended or angry at someone? Well I for one refuse to conform to a world where people are afraid to speak their minds or the truth. To be politically correct is to deny yourself the truth, to never speak your mind for fear of offending or hurting someone’s feelings. Are you kidding me? I am not “PC” and never will be, simply because I will continue to speak the truth and say what’s on my mind. With that, the recipient has only two choices: like it or lump it! I was brought up to speak my mind, tell the truth, and decide how to handle others’ responses. And heaven knows I was spanked a few times for not doing what I was taught. But I survived and I’m a better person for it. For not only do I know what it feels like to tell the truth, I also know what it feels like to hurt another’s feelings, to have my own feelings hurt, to ask a question and get an unexpected answer. But I’ve had to overcome how each one has made me feel. I’ve learned how to think rationally and deal with unpleasantries. Life goes on and no one ever said it would be easy. So why then are we systematically allowing this idiocy of ‘political correctness’ to take away our ability to think rationally? We owe it to children to teach them how to live truthfully. Other than employing common sense and a pinch of tact, no one should ever have to watch what they say. I’m not saying to be cruel with your words, nor am I saying to deliberately hurt someone verbally, NO! I’m saying we need to breathe like we use to do before all this ‘political correctness’ rubbish. The worst is the workplace where it seems to be getting increasingly difficult to use your own mind and dare I say it – common sense. I’ve watched employees go from assertive to meek to the point where when someone finally asserts her/himself, they are blacklisted and I want to know why. What is it that we are so afraid of that we don’t want anyone having a backbone or a thought for themselves? Why is it so hard to accept someone who stands up for themselves and what they believe in? And most troubling, why is it insulting for someone to speak their mind? Freedom of speech IS part of our Constitution, after all. As long as that speech isn’t treasonous, or deliberately offensive, why should our superiors attempt to suppress our natural inclination to express our individual opinion? I find myself searching for people who refuse to conform to this ‘political correctness’ because with those people, I’ll always know where I stand, there’ll be no illusions about their feelings or yours, and the backstabbing will be less. I urge you to take the poll below, leave a reply if you have more to say, or do both and tell me, what are your thoughts on political correctness? This entry was posted in Musings, Political Correctness and tagged POLITICAL CORRECTNESS. Bookmark the permalink.